Today was a beautiful autumn day on Roosevelt Island - cool, crisp and sunny. 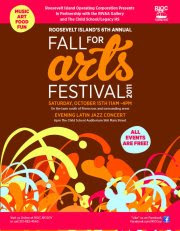 Perfect weather for the 6th annual Roosevelt Island Fall For Arts Festival presented by the Roosevelt Island Operating Corp (RIOC) and the Icla da Silva Foundation Roosevelt Island 5K Run/Walk for bone marrow donation awareness. and the Icla da Silva Foundation 5K Run/Walk. Additional information on the Foundation available at its web site. More scenes from today's Icla da Silva Foundation Roosevelt Island 5K Run/Walk and Roosevelt Island Fall For Arts Festival. No question about it - today was a very nice day!!! Trio in c minor, Op 1 no 3. Here's a You Tube Video of Schumann's Fantasy Pieces for Cello and Piano. Enjoy. To celebrate the city’s architecture and design, the 9th Annual openhousenewyork Weekend will once again unlock the city, allowing New Yorkers and tourists alike free access hundreds of sites talks, tours, performances and family activities in neighborhoods throughout the five boroughs. From private residences and historic landmarks, to rooftop farms and sustainable skyscrapers, OHNY gives you rare access into the extraordinary architecture that defines New York City, while introducing you to the people who make the city a vibrant and sustainable place to live, work, and play. Roosevelt Island sites on the OHNY schedule are the AVAC Underground Garbage Collection system and the Roosevelt Island Historical Society Visitors Center Kiosk. A tour of the FDR Four Freedoms Park construction site is also on OHNY's schedule but is sold out. A previous post of Roosevelt Island Operating Corp (RIOC) President Leslie Torres Report included this information on the AVAC system. ... Since 1975, the Automated Vacuum Collection System (“AVAC”) has been transporting the majority of Roosevelt Island’s solid waste through tubes connecting the residential buildings to a sanitation facility located by the Roosevelt Island Bridge. Because of this system, we are able to reduce the number of NYC Department of Sanitation trucks that ride our street by 18 trucks a month. More information available from previous posts on the Roosevelt Island AVAC system and Visitors Center Kiosk. The October 5 Roosevelt Island Residents Association (RIRA) meeting was, to put it mildly, contentious, angry and controversial. There was even a brief, less than a minute, altercation between two Council Members. Fortunately, both Council Members realized quickly that their tempers got the better of them and they quickly made peace with each other. Mr. Katz's LATFOR redistricting testimony was criticized in the Housing Committee Report as being disrespectful to State Senator Jose Serrano and to the entire Senate District he represents, including Roosevelt Island. Roosevelt Island elected officials including Senator Serrano, Assembly Member Micah Kellner and NYC Council Member Jessica Lappin wrote a letter published in this Blog criticizing Mr. Katz's redistricting testimony to which Mr. Katz replied. State Senator Liz Krueger also signed the letter criticizing Mr. Katz's testimony. Mr. Katz raised the issue of his redistricting testimony and addressed the charge that he insulted Senator Serrano in his October RIRA Meeting President's Report. Mr. Katz denied that he intended any criticism of Senator Serrano, apologized to Senator Serrano for any misunderstanding and told the RIRA Common Council that the letters from elected officials critical of him (Mr. Katz) were withdrawn. 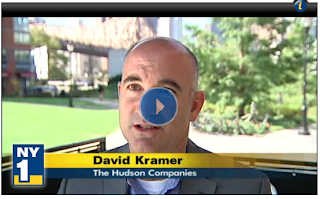 Here's the video of Mr. Katz's President Report. Mr. Katz's statement regarding his redistricting testimony and Senator Serrano begins at approximately the 1 minute 5 second mark. During last night's RIRA meeting, Matt Katz said that the letters from elected officials criticizing his testimony at the Redistricting hearing about Senator Serrano was withdrawn. Here's You Tube video of what Matt said. At about the 3 minute 30 second mark Matt talks about the letter being withdrawn. The WIRE informed me and Councilmember Lappin that they didn't have space to run Mr Katz's testimony, our letter, and his response to our letter. Based on that information, the WIRE asked if would withdraw our request to print our letter and we agreed. I received a similar reply from Ms. Lappin's office and sent the following inquiry back to Mr. Kellner and Ms. Lappin's office. Just to clarify what happened. As you know, I published the letter from the elected officials criticizing Matt Katz's testimony during the redistricting hearing. Are you now saying that the criticism of Mr. Katz in those letters is being withdrawn by those elected officials? If so, should I update the post with a retraction? Or are you just saying that you withdrew your request to publish the letter in the recent WIRE because the WIRE editor advised you that he didn't have space in that edition and that your criticism of Mr. Katz's testimony has not changed? As I mentioned, I am preparing post which includes this issue and want to make sure I get it right. We are confirming that we withdrew our request to publish the letter in the recent WIRE because the WIRE editor advised us that he didn't have space in that edition. Is it true that Roosevelt Island elected officials, Lappin, Kellner, Serrano, asked the WIRE to publish their letter criticizing RIRA President Matt Katz's testimony during the recent redistricting hearing and you declined to publish it in most recent issue either because the WIRE lacked space for their letter and response by Matt or for any other reason? I am preparing a post which includes this subject and, if you wish, am happy to include any comment you may have. The letters were withdrawn, by their writers, at the request of Senator Serrano. I insisted that I would need emails from the writers, rather than simply Senator Serrano's request to me, to take them out of the paper. He arranged for them to write said requests and, when those requests were received here, their letters were removed from the edition. There is no remaining issue between Matt Katz and Senator Serrano, but if you keep working at it, you may succeed in efforts to stir one up. 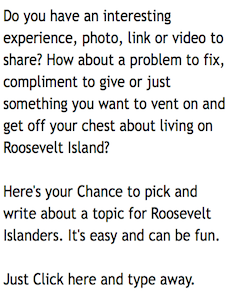 That would be fun for your blogging, and bad for Roosevelt Island, but, of course, we all know that, for you, the blog comes first. Shortly after receiving the response from the WIRE Editor, I had a conversation with a spokesperson from Senator Serrano's office who told me that the elected officials did not retract their letter concerning Mr. Katz's redistricting testimony and that any impression that they had done so was not true. The spokesperson also said that they want to move on to other more important Roosevelt Island issues. Regarding the issue of whether the WIRE did not publish the elected officials letter because of lack of space, the Serrano spokesperson said that was not the case and that it may have been a misunderstanding as was Mr. Katz's statement that the letter had been withdrawn. As reported in comment to this post, the Housing Committee report was rejected by the RIRA Common Council and sent back to the Housing Committee. There will be more on the Housing Committee report and the October RIRA meeting. I am writing to clear up any confusion that may exist regarding my decision not to publish my response letter in the Main Street Wire. Since the Wire did not print the recent redistricting testimony given during the LATFOR hearing, I did not think it necessary for that publication to print my joint letter with Senator Krueger. For this same reason, my office also informed Councilmember Jessica Lappin that there was no need for her to publish her joint letter with Assemblymember Kellner in the Wire. We hope this clears up any confusion, as we are all eager to move on to much more important issues facing Roosevelt Island. Please be advised the elevator which allows access to the Main Street Theatre/Jewish Congregation Center has been out of service. Unfortunately the company responsible for making these repairs is unable to do so at this time as they are waiting for a part that is instrumental to its repair. A follow up advisory will be sent once the elevator is back in service. 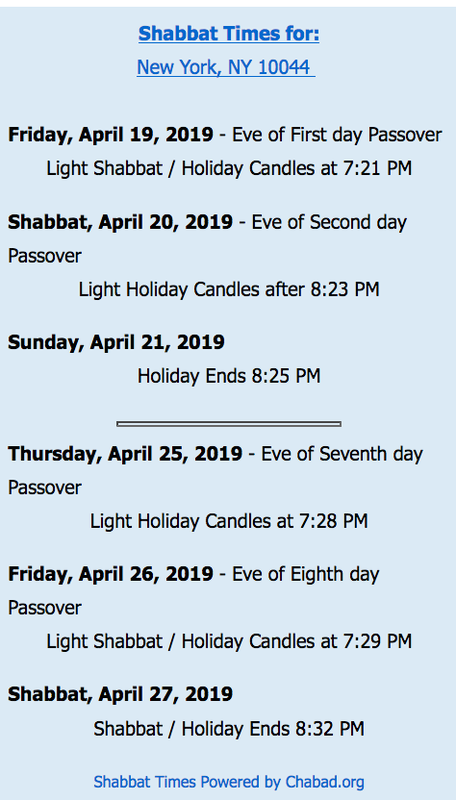 The elevator was out of service during the Jewish Yom Kippur Holiday making it difficult for senior citizens and disabled residents to attend services. New Parents Expo Coming To NYC This Weekend - Any New Roosevelt Island Parents Interested? This previous post reported on a new Roosevelt Island Mom, Eva, seeking information on Roosevelt Island events and activities for new parents. Perhaps this weekend's New Parents Expo may be of interest to Eva and other new or expectant Roosevelt Island parents. My friends at New York Family Magazine will be hosting a New Parents Expo this Saturday and Sunday at Pier 92. Let’s just say this expo has it all, and so much so it even makes me reconsider having another child . . . well, almost. I’m dealing with the teenage years now—there’s no going back for me. But that’s a story for another day. More information available on the New Parents Expo from Life of Riley NYC. 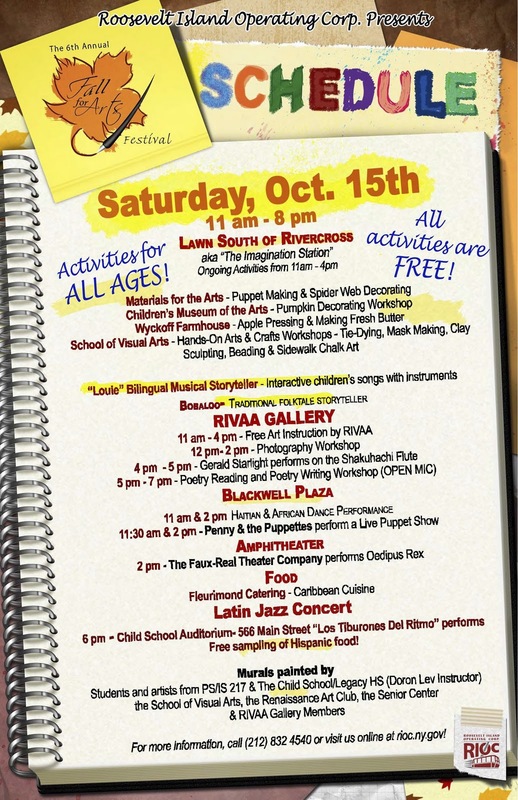 Please see the attached schedule of events for this Saturday's Fall for Arts Festival. 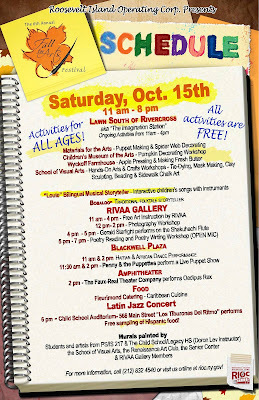 All events are FREE and appropriate for children of all ages. Here's Rachel Maddow's full report on the connection between Occupy Wall Street Protest and the Roosevelt Island Tram/Gondola. (Thanks for the tip Chris). I wrote you recently that the Department of Education School Food will not provide free after school meals to children participating in the after school program. As promised, the Executive Director, Mr. Charles DeFino and I proceeded to work on restoring the free after school meal program as soon as possible. Today, I am happy to advise you that our efforts and the support we received from officials associated with various government agencies have produced positive results. Starting Tuesday, October 11, 2011, children enrolled in our after school program will be served a hot supper Monday through Friday, upon arriving at the Roosevelt Island Youth Program Beacon, around 3:00 p.m. The Department of Health approved our application for free After School Meals and School Food of the Department of Education proceeded to implement the program. In restoring this vital program we greatly appreciate the unwavering support and cooperation we received from various individuals who went beyond the call of duty in their efforts to help. Therefore, I am urging you to express your appreciation for whose contact information is listed below for their efforts to restore the program. Their future cooperation will always be important in maintaining and improving the services we provide to your child as well. At this time I would like to remind you that School Food provides well balanced, nutritional and fresh meals, but you may choose to provide your child with a different nutritional meal or snack. In this case, children have to bring in their snack when coming to school in the morning or have it brought to them. Children are not allowed to leave the premises between school dismissal and the start of the after school program. They are also not allowed to leave the premises during the after school program. If you are providing your child with a meal or snack, please make sure that you choose nutritional items; sodas, candy and other sugary food are not allowed. 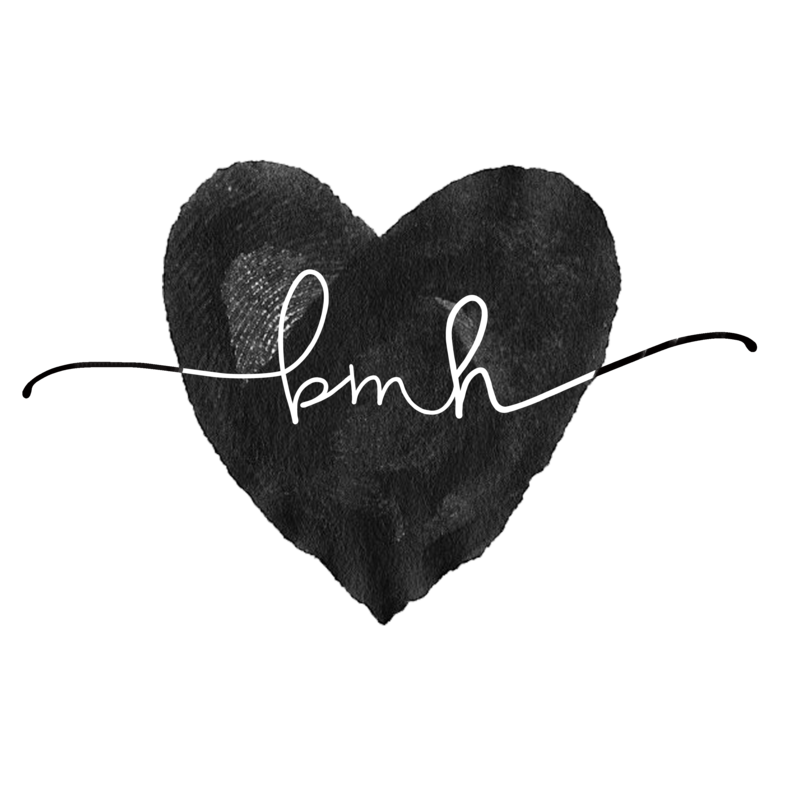 Music and video by Thomas Oboe Lee. Second mvt. from "String Quartet No. 12 ... The Seasons" (2010) with QX Quartet: Krista Buckland Reisner, Rohan Gregory, Peter Sulski and Jan Müller-Szerawz. and today the wider staircase was in place ready to be used by Tram passengers. Here's what the staircase used to look like. At least now, the bottleneck caused by Tram passengers exiting and entering the station at this point will be reduced. The Roosevelt Island Operating Corporation cordially invites you to our 6th annual Fall for Arts Festival. 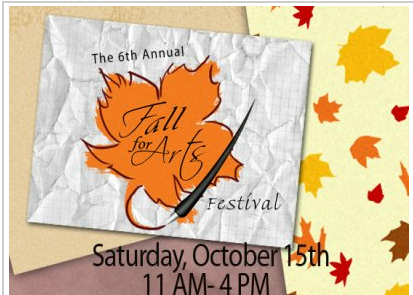 Whether you're a foodie, an artist at heart or family just looking for fun activities on the weekend, you'll be able to find it at this year's Fall for Arts Festival. The FREE event will include participation from vendors such as the Children's Museum of the Arts, Materials for the Arts and English-Spanish children's musician "Louie" just to name a few. The "Imagination Station" will feature storytelling, puppets, crafts and cooking stations for adults. In celebration of Hispanic Heritage Month, a Latin Jazz concert and Latino themed poetry reading will cap off the evening. During the concert, you will get a chance to sample Hispanic foods, desserts and drinks! Both events are FREE and appropriate for children of all ages. 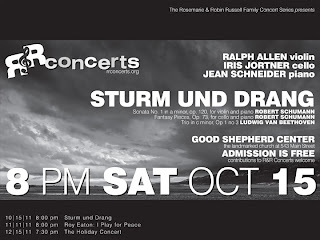 Scenes from past Roosevelt Island Fall For Arts at previous posts. Click here for an update on the Roosevelt Island Residents Association (RIRA) censure motion against former RIRA President and current Planning Committee Chair Frank Farance discussed during the October RIRA Meeting. The final vote tally was 12 in favor of Censure Motion, 10 against and 4 abstentions. 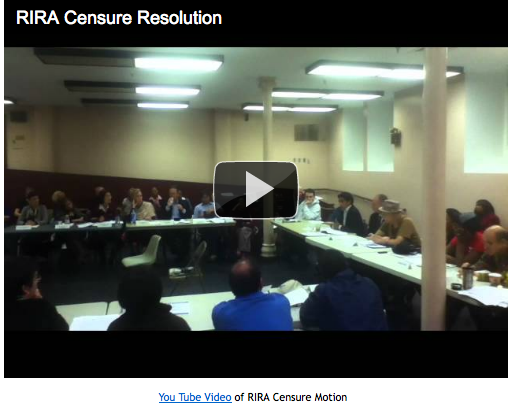 The update includes video of RIRA members discussing the Censure Motion. Stanford Partners With CCNY On NYC Engineering and Science Collaboration - Is Local Partner Tipping Point For Stanford's NYC Applied Science & Engineering School On Roosevelt Island? In response to Mayor Michael Bloomberg's call to strengthen New York City's economy by creating a world-class applied science and engineering school here, Stanford University President John L. Hennessy, The City University of New York Chancellor Matthew Goldstein and City College President Lisa S. Coico today announced the creation of the Stanford-CUNY Collaboration at City College, or Stanford@CCNY. Joining East and West Coast resources in an innovative new arrangement, Stanford@CCNY has the potential to offer the students and faculties of both universities transformative opportunities to partner at the undergraduate, graduate and post-doctorate level and would provide start-up space for Stanford's proposed applied science campus. Stanford@CCNY will immediately begin to create an East Coast demonstration site on the City College campus for Stanford's undergraduate curriculum in entrepreneurship, technology management and related areas. The program in innovation learning is funded by a grant from the National Science Foundation to the Stanford Technology Ventures Program, the entrepreneurship center of the Stanford School of Engineering. "City College and City University have been educating the students of New York for more than 160 years and share our commitment to innovation and technology commercialization," President Hennessy said. "CCNY also has an excellent track record for bringing underrepresented minorities into engineering, which is a clear national priority. We believe there is tremendous potential through our partnership with CUNY to bring Stanford's curriculum to some of the best and brightest students in New York and to help them go on to make significant economic contributions to New York City and New York State." "CUNY welcomes the opportunity to partner with Stanford University, with City College as our lead institution. Our collective strengths will help pave the way towards the establishment of world-class science and engineering education opportunities," said Chancellor Goldstein. "The two beneficiaries will be our students and the people of New York City." "This collaboration offers our students the opportunity to learn side by side with peers enrolled at one of the world's finest private universities," said President Coico. "Stanford@CCNY will create partnerships between our research-active faculty and their colleagues at Stanford, who helped create and sustain Silicon Valley, and these partnerships will incubate innovation and entrepreneurship in the technology sector right here in New York." 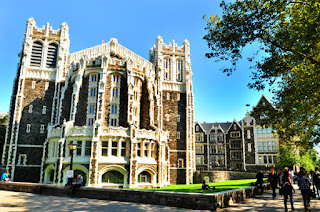 Should Stanford's proposal to create an applied science campus in New York City be accepted, the Stanford@CCNY collaboration would expand to include joint CCNY-Stanford BA/MA and BS/MS programs designed collaboratively by faculty members from both schools. Highly qualified City College students would be admitted to a co-term program enabling them to pursue a BS degree from City College in parallel with an MS degree from Stanford. 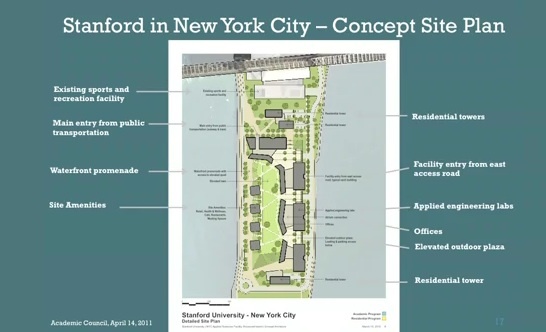 Also under the collaboration, Stanford would launch its New York academic programs in teaching and research space at the City College campus until late 2016, when Stanford's Applied Science campus on Roosevelt Island would be expected to be completed and ready for occupancy. Stanford would then turn over the upgraded space and equipment at City College to City University for its permanent use. Stanford also will host CCNY students each summer as part of its Research Experience for Undergraduates Program, allowing them to work alongside Stanford students in faculty research labs on its California campus, or as part of its Summer Institute for General Management, a four-week program focused on business fundamentals. As part of Stanford@CCNY, faculty and students from both universities will create mechanisms to collaborate on the inspiration, inception and incubation of new enterprises that will contribute to growing the New York economy. Stanford would renovate and temporarily occupy up to 20,000-square-feet of instructional space on the City College campus, as well as space for up to 20 Stanford faculty members. Stanford and CUNY students and faculty would live and work together, with the possibility that students from both universities could have access to courses offered by both institutions. Stanford University is preparing its response to Mayor Bloomberg's call for proposals for an applied science campus in New York City with the potential to generate economic growth in the technology sector. Stanford is proposing to build a graduate campus on Roosevelt Island that would focus on engineering, information technology and entrepreneurship, growing in phases to eventually accommodate 100 faculty members and 2,000 master's and Ph.D. students. Proposals are due to the New York City Economic Development Corporation on Oct. 28. The city has announced that it expects to make a decision by the end of the year. ... Cornell’s established presence in New York would give its proposal the edge over those of other contending universities. 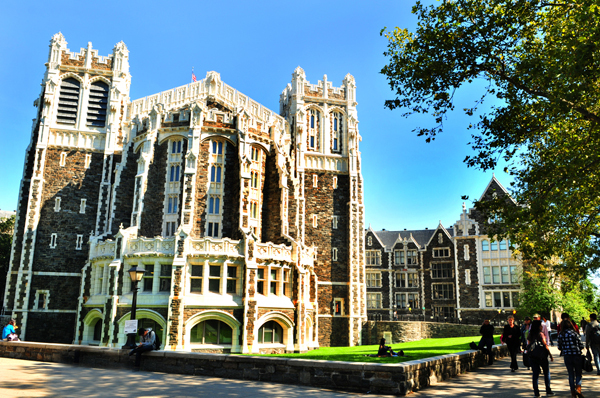 A university can't have better New York City roots or be more local than CCNY and Stanford is partnering with them. Although Mr. Taubman stressed that any plan was still preliminary and subject to many unknowns, he said that Stanford now plans not to have housing on the campus but for housing to be spread through the existing Roosevelt Island community which may include the future buildings 7-9 at Southtown. Hudson Related should be thrilled to hear that. Mr. Taubman also emphasized Stanford's desire to work very closely with our local public school - PS/IS 217. The October Roosevelt Island Residents Association (RIRA) meeting had the following discussion on the differences between Stanford and Cornell's approach to a Roosevelt Island campus. Roosevelt Island Residents Association (RIRA) Public Safety Committee Chairperson Erin Feely-Nahem reports to RIRA's October Common Council Meeting on the new NYPD officer assigned to Roosevelt Island and the weekend young adult recreation program at Sportspark. I noticed a P3 Communications mobile phone testing measuring vehicle on Roosevelt Island this afternoon. Was P3 Communications measuring the current level of wireless phone service on Roosevelt Island or something else? Maybe it had something to do with the wireless smart parking system. Not sure what they were doing but two people exited the van with handheld devices and started to walk north on Main Street. I have AT&T cell phone service for my IPhone and have not experienced any significant reception or data problems on Roosevelt Island. Will soon be upgrading to new IPhone so will have a choice between continuing with AT&T or switching to Verizon. How's your wireless phone service? NY 1 Reports On Plans For New Roosevelt Island Main Street Retail - Is A Pet Store Among Roosevelt Island Priorities For Main Street? NY 1 was on Roosevelt Island last Friday interviewing Roosevelt Islanders regarding plans for new stores on Main Street. Part of Roosevelt Island boasts beautifully manicured lawns, new buildings, and a nice mix of new retailers, but just a few blocks north, the Main Street corridor seems a bit out of date. ... Hudson/Related representatives say they surveyed all 14,000 island residents and quickly learned what they want: things like a wine shop, an ice cream parlor and a pet store. Some Island residents NY1 spoke with say they're not entirely sure what to expect. Others already have a wish list. "A lot of people want franchise businesses, McDonald's and Burger King," said one resident. Is, as the Hudson/Related representative claims, a pet store really wanted on Roosevelt Island? and the Octagon Park Lawn. Despite not being allowed in these areas, some Roosevelt Island dog owners or walkers continue to ignore these signs and bring their dogs where they are not permitted. Considering that pet supplies are already available at our local Duane Reade and Gristedes, is a pet store for Roosevelt Island's Main Street a priority? There is a Main Street Town Hall Meeting scheduled for October 20 at the Good Shepherd Community Center where you can learn more about plans for Main Street retail and express your opinion to the Hudson/Related Master Leaseholder Principal David Kramer. Roosevelt Island is a popular spot for East River fishing. Usually, you can find people fishing at the tips of Roosevelt Island - either at Lighthouse Park or near the entrance to Southpoint Park. This weekend I spotted some fishermen at the Subway Pier. Fishing is something everyone should do and everyone enjoys. Even if you don't catch you can see from my face that I am having a wonderful time fishing.